As an industry observer, I have witnessed an explosion of market data testifying to the growth of out of home (OOH) advertising in the past couple of years. To make sense out of all this new information, I have tried to summarize it and put it in perspective in this article. As most traditional, and lately even online media, are going through a rough patch, OOH advertising keeps gaining strength. The latest numbers from Kantar Media and Miller Kaplan show US OOH ad revenue growing for the 21st consecutive quarter year-over-year. Mergers and acquisitions in the sector have reached record volumes. The technology side of the digital out of home (DOOH) business – digital signage – has been expanding at 15-22 percent CAGR (compound annual growth rate), rivaled only by mobile marketing tech. Other reports confirm that gains are driven mainly by digital and mobile-related advertising. This is all the more impressive, considering less than two percent of roadside OOH is digitized to date. OOH and DOOH campaigns are increasingly proving their effectiveness either via traditional metrics (panel research) or new, high-tech methodologies (electronic viewer detection and mobile engagement). As we see from the findings above, all vectors point in the direction of continued adoption and growth. Let’s analyze the forces defining today’s OOH ad business in more detail. In the modern media landscape, OOH finds itself in a highly favorable position. The continuing fragmentation of TV, radio, print, and online media leaves OOH as the only remaining true mass medium. Moreover, OOH appears to be free from the shortcomings of other media. OOH does not interrupt any activities as TV, radio, and mobile ads do. At the same time, OOH is not affected by ad fraud, ad skipping, ad blocking tech, and the low ‘viewability’ rates plaguing online and mobile advertising. OOH has been rated the second most-trustworthy medium (after TV) in a 2014 study by the international OOH industry body, International Fédération de la Publicité Extérieure (FEPE). The entrepreneurs, who saw the potential of OOH in the fast-changing world of advertising long before others did, enjoy solid returns today. 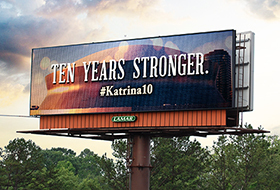 Among them – the largest OOH ad operators JCDecaux, OUTFRONT Media, Clear Channel Outdoor, Lamar Advertising, and Ocean Outdoor. The agencies that chose to specialize in OOH media also see their efforts paying off. The most prominent ones are Kinetic, OMG/OMA, and Posterscope. Grand Visual is an example of a creative shop that invested in DOOH content production 10 years ago. Today Grand Visual is behind many innovative award-winning campaigns for some of the biggest brands. Top Fortune 500 companies traditionally have used OOH. Today, after a few years of experimenting with its digital offspring, DOOH, many of them are actively adopting it. McDonald’s, Coca-Cola, Warner Bros. Pictures, Citi, Chase, NBC Universal, Google, Microsoft, Apple, Anheuser-Busch are among those running spectacular DOOH campaigns that create social buzz worldwide. In fact, Google rocketed from number 88 in total OOH spend in 2013 to number 21 in 2014. A clear sign that OOH’s strength is being noticed is the attention it gets from the biggest technology companies in advertising. Apple launched iBeacons for retail and OOH advertising in 2014. The iBeacons are often used in conjunction with DOOH, which facilitates mobile user engagement and ad-triggered purchases. Google has entered the DOOH market on several fronts. The company exhibited its software and hardware capabilities for DOOH at the Digital Signage Expo (DSE) in Las Vegas this year, for the first time in its history. This summer, Google’s startup Sidewalk Labs invested in the merger of DOOH ad operator Titan and Control Group, to form a new company, Intersection. The partnership’s LinkNYC initiative is planning to convert payphone booths into free WiFi hot spots that will also serve as advertising screens in New York. Also this year, the company introduced Eddystone – Google’s version of beacons. Facebook recently started giving away its BlueTooth Beacons to small- and medium-sized businesses (SMBs), as part of its plan to become a dominant player in mobile-empowered local advertising. Companies working on advancing the Internet of Things (IoT) keep DOOH in their sights as one of the prime applications for IoT that will enable pin-point precision in targeting and high relevance of advertising messages. OOH is now well on the path to be one of the most measured media channels. The Traffic Audit Bureau for Media Measurement (TAB) has been measuring the audience of roadside displays since 1933. TAB OOH Ratings have undergone several recent upgrades that included digital billboard and transit measurement, and at this moment the organization is working on a new, improved system of measurement for the OOH industry. TAB has enhanced its impression measurement with a Visibility Adjustment Index, or VAI. Developed on the basis of advanced eye-tracking studies, the VAI scores adjust TAB impressions to only count the people who are likely to look at OOH advertisements. This development is in sharp contrast with what’s happening in online and mobile advertising, where viewability and fraud issues are undermining their credibility. According to TAB’s President Kym Frank, no other advertising medium holds itself to such high standards. As someone who was part of the team that developed the Audience Metrics Guidelines at the Digital Place-Based Advertising Association (DPAA) a few years ago, I can confirm that. Similar initiatives aimed at developing platforms for higher precision measurement have been launched by OOH advertising associations in Australia, Canada, South Africa, UK, and by the international OOH ad body, FEPE. A number of companies have built viewer-tracking technologies that detect people who look at DOOH displays and can identify their gender, age, and race, without storing any personal information. France-based Quvidi is one of the leading companies in the field. To sum it up, a lot of progress has been made in measuring OOH. The challenge here is that advertisers today want more than the CPM metrics. Being used to the standards of Google AdWords/AdSense campaign reporting, they want the equivalent of the ‘cost-per-click ‘, that is, ‘cost-per-action’ and ‘cost per sale’ metrics, to justify the allocation of ad dollars to OOH. As described further in this article, combining OOH with mobile engagement and beacon tech delivers exactly that. The “push,” or “interruption” model, where ads intrude upon people when they are enjoying entertainment or news content, is the concept upon which the TV, radio, and online display ad businesses are built. Such advertising is being actively rejected by modern consumers. Google put advertising from its head on its feet when it introduced the “pull” based concept of AdWords, whereas advertisers pay only for the ads clicked on by consumers while they are searching for products and services. This has made Google the media giant it is now. Unlike the “push” ads, OOH is not intrusive, as people always have a choice not to look at posters. However, studies show that when the OOH content is relevant and well designed, people notice, and many act on it via mobile phones. In this respect OOH, especially when coupled with mobile, is closer to the “pull” model, widely preferred by consumers. Mobile advertising is on the rise because of the irresistible temptation on the part of marketers to try and reach hundreds of millions of smartphone users. True, people spend many hours a day on their devices. But this does not necessarily mean that they want to see ads on their phones while they are busy. Even though mobile marketing is the fastest-growing medium at the moment, if used on its own, it faces strong rejection by consumers. In most cases it still represents the old “push” model that is based on interruption of users’ activities. The situation changes dramatically when mobile is integrated with OOH. In many recent campaigns, OOH ads prompted people to use their mobile devices to find more information, get a coupon, enter a contest, or make a purchase. When that happened, we saw a “pull” effect, with an exceptionally high ad ROI. Studies show that consumers spend 70 percent of their waking hours away from home, which means that they are more exposed to OOH ads as ever before. They also have their smartphones with them. This makes the symbiosis of OOH and mobile a most powerful combination in today’s advertising arsenal. In the absence of other readily available, scalable OOH ROI measurement platforms, combining OOH with mobile engagement provides an immediate and precise mechanism of tracking campaign effectiveness. When captured by mobile, the data can be logged, analyzed, and reported in convenient formats. The integration boosts both media in a way that wouldn’t be possible if they were used separately. Beacon tech was developed quite a while ago, but it was recently rediscovered as an effective bridge facilitating the connection between businesses, OOH, and mobile consumers. Beacons help smart phone users get relevant local information, including promotions of products and services. Meanwhile they allow advertisers to make that information more targeted, and therefore more useful. The OOH-beacon-mobile combination provides another avenue for instant reporting on campaign effectiveness, as it logs data on engagement and sales. The number of beacons deployed in retail and related applications is growing at CAGR of nearly 300 percent a year, and is expected to reach 4.5 million in the US by 2018 (Source: Gimbal). Although beacon-enabled notifications are of the “push” nature, mobile phone users have to opt-in to receiving them, which transforms it into a “pull” type engagement. With all the fascinating advantages and growth rates, OOH still accounts for only $7+ billion (2015 projections) of the total US ad spend, which amounted to $141.2 billion in 2014. (Kantar, measured media report). What are the barriers preventing this robust medium from getting the ad spend share it deserves? 1. The old agency model is broken. The answer may lie in the legacy media buying infrastructure. Most agencies are still structured for buying TV, print, and radio, while OOH has traditionally been a bit of an outlier. The agency wisdom goes: “No one has ever been fired for buying TV”. TV and radio ratings, print circulation, and online page views are still the dominant metrics in the agency world. Using them requires less effort, compared with the amount of research and coordination media buyers have to do if they go with OOH and DOOH media. OOH properties need to be integrated into agencies’ trading systems, where all data required for planning, buying, and reporting is available. OOH buying should stop being more difficult than buying TV, radio, and print. 2. Measurement has to go beyond CPMs. Standardized ad effectiveness currencies need to be introduced to elevate the status of OOH and DOOH in the media mix. 3. Advertisers should know about the true value of OOH. A recent study conducted by Clear Channel Outdoor UK revealed that less than a third of marketers are aware of OOH’s newly acquired engagement capabilities such as mobile/beacon integration, intelligent content, and new data platforms. Industry associations – [OAAA (USA), FEPE (global), OMC (UK), DPAA (USA), OVAB Europe, OMAC (Canada), OMA (Australia)] – and specialist agencies are actively promoting the benefits of digital-enabled OOH. In 2013, OAAA started an outreach initiative aimed at educating the advertising community about the value of OOH. The association scrupulously monitors and accumulates the latest findings by reputable research bodies to help its members sell the medium with a consistent message. 4. Content is not king (yet). Unfortunately, apart from the prominent intelligent campaigns that make headlines, a lot of content produced for DOOH is repurposed from TV and online campaigns, which makes an ill fit and does not help the industry’s case. I pay attention to the digital billboard and DOOH ads wherever I travel, and very often I see that the basic requirements are not met: there is too much text, the fonts are too small, and the screen is too busy to grasp the pitch. This explains why creative shops such as Grand Visual are thriving on the vast demand for quality DOOH content, but there is room for many more such shops. As Adweek reported recently, today even one clever local billboard ad can create a global viral buzz via mobile and online media. But this is more of an exception than the rule so far. Against the backdrop of problems experienced by TV, print, radio, and online advertising, OOH is emerging as a highly effective, accountable, and affordable mass medium of the future. The integration with mobile and beacons is promising to open up vast opportunities for OOH advertisers. Big hopes are placed on the programmatic buying and its potential ability to standardize and streamline the buying process for OOH and DOOH. OOH is a perfect fit for the rapidly developing IoT and its commercial potential. The few remaining skeptics should keep this in mind: the oldest advertising medium is being reborn, rejuvenated by digital and measured by new technologies. OOH is about to enter its golden era. 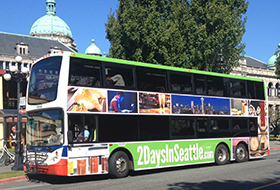 Lamar Advertising Company, one of the largest outdoor advertising companies in North America, today announced its recent transit advertising contract renewal with BC Transit for an additional ten year term. The new agreement commenced August 1, 2015, and will enable local, regional and national brands to reach more than 50 million commuters across British Columbia per year.